The Hotel Antico Palazzo di Rospigliosi, was officially opened in December 2005 (formerly called the Hotel Le Cappellette di San Luigi 2001-2005) and is located in the centre of the Square "Santa Maria Maggiore" ( the square has recently been renamed Piazza Esquilino), the building can trace it's roots way back to the year of 1585 when it was constructed and named the "Palazzo Rospigliosi". The Rospigliosi, a rich aristocratic Roman family, lived here for more than 150 years and in that time many prominent Roman and Religious persons were guests.... The walls of the Rospigliosi have witnessed much learning and art and poetry were frequently discussed in the 2 reading rooms. Paintings were made and music was composed byboth Roman and foreign aristocratic guests. To this day every corner of the building perpetuates an atmosphere of knowledge and learning something which sadly many of today's buildings do not. The Antico Palazzo Rospigliosi is both a Roman and National art treasure and consquently protected by both world heritage and the local ministry for the arts. A precious national heirloom the Antico Palazzo Rospigliosi must never again be allowed to fall into a state of disrepair from which it was rescued in the Spring of May 2001. By studying its long and illustrious history it is hoped that one can perhaps understand what happened in all those centuries, in some way reliving the experiences shared by its residents which include the Roman families of Rospigliosi, Ciampini, Lercaro, e Borromeo, travelling back hundreds of years these names will live on in eternity but who were they really, Ciampini? The Rospigliosi? We hope that you will be our guest and thus ensure that you too become, in a little way, part of its history. One of the first owners of the building was Monsignor Giovanni Giustino Ciampini who bought it for 6000 scudi from the Vaini family. A notable Roman erudite from the late 16th century Ciampini was a pioneer of Christian architecture and a few of his scientific instruments are still housed here (most have been transferred to the museum for safe keeping). Among Ciampini's most famous accomplishments was his creation and publication in 1668 of the first ever "Newspaper for Letterists" or Giornale de' Letterati which was the first of its kind in Italy and the third in the world (after the Journal des Scavants Paris and The Philosophical Transactions London). After Ciampini's death in 1695 the ownership was transferred onto the Rospigliosi a noble family the head of whom's household was also the Prince of Castiglione. The Rospigliosi lived here until the middle of the 18th century and it was above all others Camillo who gave it its name "Antico Palazzo Rospigliosi", Camillo, relation of Giulio Rospigliosi (Pope Clemence the 9th), was supposed to live in the palatial surroundings of the Quirinale but instead preferred a smaller residence on its own, consquently Camillo chose to live in the Antico Palazzo Rospigliosi (as it had since become known). Camillo lived here, wedged between Via Paolina e via Liberiana. Today the Hotel Antico Palazzo Rospigliosi is still referred to as the ex palazzetto Rospigliosi, in honour of the selfless Camillo. The Antico Palazzo Rospigliosi embraces the spirit of Rome and especially of Christmas when Santa Maria Maggiore is used for the official Italian celebration of Xmas. Camillio (1646-1722.) son of figlio di Giovan Battista Rospigliosi and Camilla Pallavicini loved the palace. Giovan Battista was the son of another Camillo Rospigliosi (the Pope's brother) and of Lucrezia Cellesi, therefore Camillio junior was the nephew of Pope Clemence the ninth and of the first Camillo Rospigliosi. and Towards the end of the 17th century the Rospigliosi passed the ownership deeds of their ancestoral home to the Marchese Francesco Maria Imperiali Lercaro, who let the home to the Apostle Missionaries. Prince of the sacred Roman Emperor Camillo Junior, on the death of his father, became the Duke of Zagarolo and lived in the Antico Palazzo Rospigliosi. The prince was surrounded by artists and painters including Reder, Masucci, Giovanni Bottani, Paolo Monaldi, the latter of which was commissioned to paint some episodes of his life (sometimes he would go to the races). These paintings may still be seen dotted about the Hotel Antico Palazzo Rospigliosi. 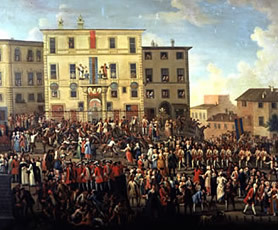 Two of the best paintings can be viewed at the Museo di Roma, the first by Giovanni Reder depicts the Exterior of the Palazzo Rospigliosi and Santa Maria Maggiore and shows the celebration of Prince Camillo's victory over the barbarian Folletto 1748. 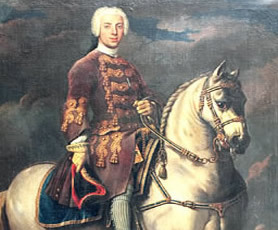 The second painting by Agostino Masucci shows the Prince Camillo Rospigliosi on horseback. 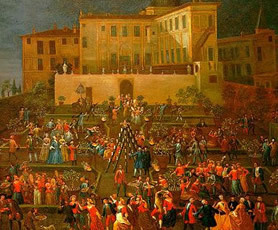 Another painting by Reder (again housed in the Museo di Roma) http://www.museodiroma.comune.roma.it shows the internal garden of the Hotel Antico Palazzo Rospigliosi in occasion of the "festa delle mozzatore", a party to celebrate the end of the grape harvest and the return from the fields of the grape pickers. More than once the Prince is painted on a white horse in a rural setting perhaps in Magliana his second residence in Rome. The Rospigliosi originally came from Milan, in the 12th century they fled to Tuscany in order to escape the persecution by Federico Barbarossa. In the first quarter of the 14th century they commenced agricultural, commercial and industrial activities which saw them amass a small fortune. On account of their riches the Rospigliosi were awarded titles and political power a Pistoia and later with the armed pontifice for Pope Martin the 5th and then Paolo the 3rd. They were given the fine distinction of being indoctrined into the Knights of the Order of Malta. Despite all of this the family continued with its commercial activities which involved wool and farming thus ensuring a sustained period or posterity which continued for over 3 centuries. In 1667, Giulio Rospigliosi – cultured and refined personality, son of Girolamo and Maria Caterina Rospigliosi Became Pope Clemence the 9th. 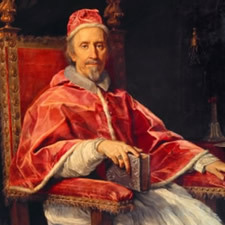 His pontefice didn't last long, only 2 years(1667-1669), his time in office was riddled with poor health and his fame is more down to what he did before he became Pope as he was among other things a brilliant writer. A master of melodrama and oratory skills Giulio appeared often in theatres in Rome and especially at the Palazzo Barberini. He was often painted performing and one painting by Pietro da Cortona shows him in full flow (this is now housed in a private collection in the UK). Nevertheless, you can view a couple of his portraits, one by Maratti, at the Pinacoteca Vaticana; and another by Gaulli inside the Gallery of Ancient Art in via delle quattro fontane. Among Giulio Rospigliosi's most notable works was his opera Sant'Alessio which was first performed at the Palazzo Barberini on via Quattro Fontane on the 8th of March 1631. The music for the opera was composed by Stefano Landi. The opera was much loved by the Roman people and received several encores, it was performed again at the Palazzo Esquillino and repeat performances were held for years to come. The opera was about a young Roman nobleman who after his return from a pilgrimage to the holy land decided to renounce his riches and titles preferring instead to live his life in a cupboard under the stairs. The opera recounts how how others in the same social circle found his behaviour derisory whilst the people loved him. During this period (the mid 1630's) the Palazzo Rospigliosi was considered one of the most important cultural attractions, memorable for the melodramas and a series of productions including the "La Replica dell'Egisto" 1637 which was perfected by Gian Lorenzo Bernini and stunned contemporary composers and writers. The work is still considered the first Italian Musical Comedy and one of the best examples of 17th century poetry. The most innovative novelty was the use of stage props such as masks (by Zanni and Coviello), the tasty dialect and the "Burattinesche" movements, which was very unusual and "alien" to many aristocratic ears. In 1643 The Saint Eustachio was performed and in 1654 "From Bad comes Good" which saw the start of the Rospiglione Spanish Theatrical season. In 1656 Rospigliosi was responsible for the "Queen's Carnival" Carnevale della Regina, so called in honour of the Queen of Sweden Cristina. The play's themes included Human life, Arms, Loves and again from the Bad comes Good. The Rospigliosi family benefitted enormously from Giulio's play writing career and consequently, his brother Camillo and his nephews moved to Rome in the Summer of 1667 all of whom were giving important roles in local government. Another great achievement of Giulio Rospigliosi was to have contributed enormously to the creation in Italy of The Great Spanish Theatre "Grande Teatro Spagnolo del Siglo de Oro". Giulio's love of Spanish Theatre was born as a result of his time spent there earlier in his life. In 1669, on the night between 25 and 26 October The Pope suffered an apoletic fit, he recovered briefly only to suffer another attack on the 28 of November. The Pope died on the 9th of December and was buried in the Tomb of Santa Maria Maggiore. In 1671 the tomb was honoured and a monument by Rainaldi commemorates the spot.